Akron Children's Hospital provides training to future healthcare providers, including nurses, physicians, radiology technologists, medical technologists, child life specialists, and other allied health professionals, through a variety of educational opportunities. Ranked a Best Children's Hospital by U.S. News & World Report, we are the largest pediatric healthcare provider in northeast Ohio. Our training programs offer clinical experience in a supportive environment and help prepare participants in providing quality, evidence-based care. 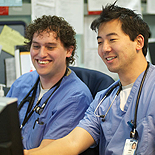 Educational opportunities range from pediatric residency and fellowship programs to clinical placements and internships.